Internet Relay Chat (IRC) has been around for along time and is as relevant today as it was ten years ago. IRC works on a client/server basis. A server hosts a series of channels (rooms) and clients connect to the server and join the channels. The clients (users) can then chat to each other using text. 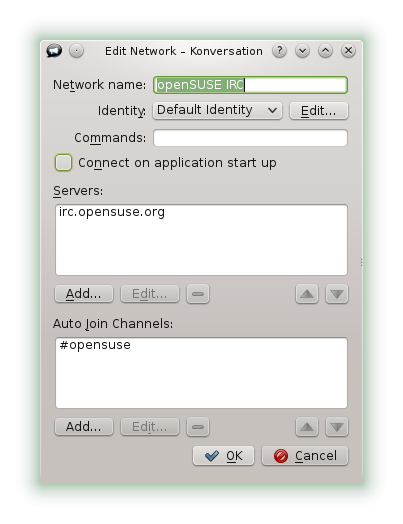 There are a number of IRC chat clients available for Linux but if you are using a KDE based distribution such as openSUSE or Kubuntu then you will have one installed by default and that is the topic for this article. 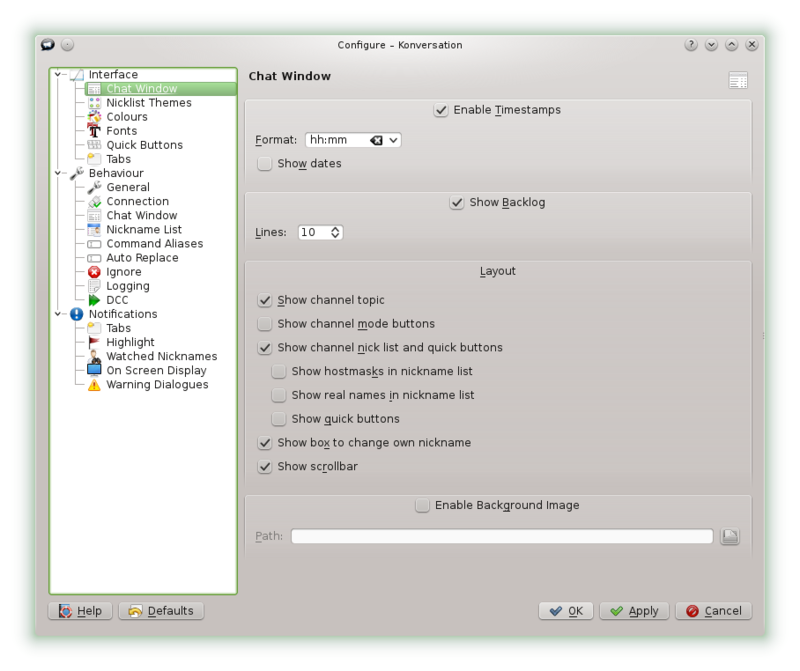 Konversation is the default IRC chat client that is installed with the KDE desktop environment. 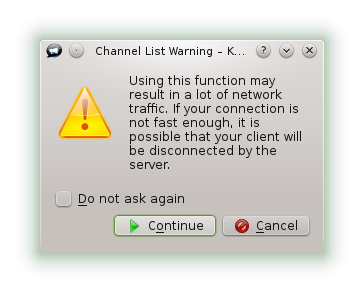 When you first start Konversation a screen will appear showing the available networks that you can connect to. To add a new network click the “New” button and to edit the details of a network click the “Edit” button. You can now change the network name, edit your identity or add and edit servers associated with the network. If you know the names of the rooms you would normally join you can add them to the list of channels to auto join. Click here for a list of available servers. To edit your identity click the “Edit” button next to identity. When you connect to IRC servers you are identified by a nickname. IRC doesn’t work the same way as email or Facebook. 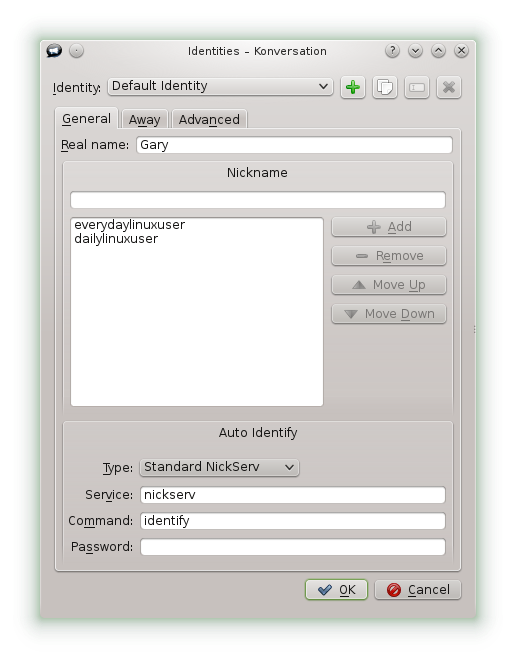 A nickname isn’t generally associated with one user (although you can lock a nickname so that it belongs to just you). It is therefore a good idea to have multiple nicknames listed for your identity so that if you can’t use your preferred nickname the next one on the list is used. To add a nickname enter a new nickname in the box provided and click add. You can remove a nickname or nicknames by selecting them and clicking remove. You can change the order of preference by selecting the nickname and clicking the move up and down arrows. You can create a new identity by clicking the plus symbol next to the identity drop down list. It is therefore possible to associate yourself with different nicknames for different networks. The icon next to the plus symbol enables you to copy an existing identity. This is useful if most of the details are correct but you want to change just a couple of things. There are also icons for renaming an identity and deleting an identity. The away tab on an identity lets you determine how long it is before you are shown as being away in a chat room and the message that appears. The default setup has the server details and rooms that you have joined as tabs at the bottom. When you first log in you will have a list of server connection messages. 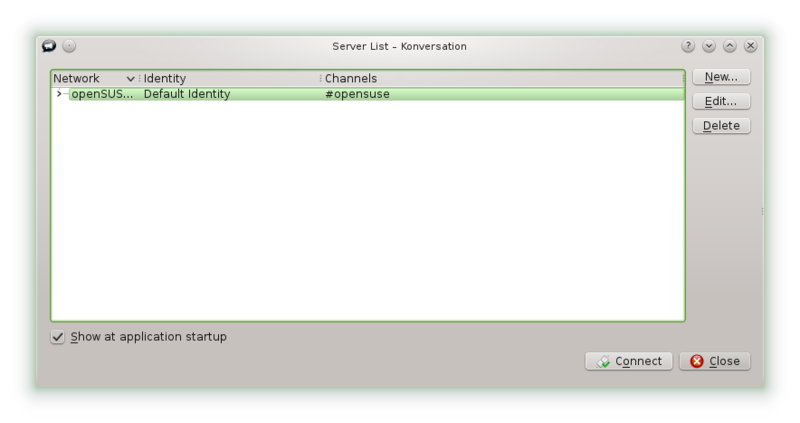 Chat rooms are denoted as tabs with a hash in front of them (#suse). The chat room has a list of users down the right, the chat window with messages in the top left and a place for you to enter your message at the bottom. Now obviously IRC wouldn’t be much fun if you only had one room to chat in. To bring up a list of chat rooms press F5 or select “Window -> channel list”. You will receive the above warning but generally you can click continue and to be honest I recommend checking the “Do not ask again” box. You can search for the topic of the room you would like to chat in by entering a topic name in the search box. You can also limit the search by specifying the minimum and maximum number of users that are currently in the room. When the list of results is returned you can sort the list by channel name and number of users. To start chatting in a room double click on the room name. The room will now open as a tab at the bottom. The configuration options for Konversation are available under the settings menu. From the settings menu itself you can hide or display the menu, toolbar, nickname list and status bar. Other configuration options can be found by selecting “Settings -> Configure Konversation”. There are settings for pretty much the entire application. In the chat window you can show or hide the channel topic (shown just above the chat window), show or hide nicknames and determine whether nicknames are shown as real names or not. If you find the background a bit dull you can jazz it up with an image. The “Nicklist Themes” lets you choose how the nicknames appear in the nicknames window. From the “Colours” option you can change the colours of all the different messages that appear in the chat window. The “Fonts” option lets you change the fonts for the text in the chat window. The one I like to change is the positioning of the tabs and that is because I am used to using XChat. From the “Tabs” option you can change the tab to be on the left instead of at the bottom. There are a whole host of behavioural settings and notification settings as well. all of the rooms are geek zones. If you are using a KDE based distro there is no need to install any other IRC Chat Client. Konversation works just as well as any other IRC client that I have used. If you aren’t used to IRC chat then it is worth visiting the Wikipedia page for IRC Chat and there is also http://www.irchelp.org/. I do not use IRC Chat very often, but as some of you know, quite a few Linux software developers and testers do, so if you want to communicate with them, this is the way to do it, and frankly, of the IRC Chat clients I've tried – and since I don't do it all that often, I have found that Konversation is a clean, fairly easy to use application, and one of the better IRC Chat clients. Thanks for the review; When I do use it again and forget how to do something, I know that I can check back here and get some quick reminders, so I appreciate that, rather than having to search all over the place!